Nazareth is the place that God chose to announce the birth of His Son. (see Luke chp 1 v 28-35). The angel Gabriel prophesied to the Virgin Mary. Nazareth was the town where Jesus grew to manhood and where his earthly parents Joseph and Mary lived. Today it is a city of about 45,000 people. 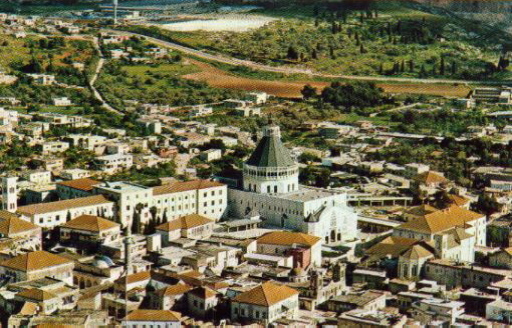 In 326AD Constantine built the first church in Nazareth, a byzantine basilica claimed to be built over the traditional site of Mary and Joseph's house. In 636AB Moslem warriors destroyed the city and it wasn't till the 12th Century that the Crusaders restored the city..
Nazareth is located in a valley in southern Galilee. The photo shows the Basilica of the Annunciation, designed by the Architect Professor Giovanni Muzio and completed in 1969.